Originally, the Sanskrit word asana was not intended to describe the countless yoga postures we now practice, but instead as a name for the comfortable and supportive seat used in meditation practice. It makes perfect sense that “seat” is the root of the word asana—having the right place to sit during meditation is truly the root, or foundation, of a great practice. The right seat will improve your posture, properly align your spine, reduce fatigue, and minimize aches in the low back and knees. While you can certainly use pillows and blankets that you have on hand, using a dedicated meditation cushion will provide the best results and might just feel special enough to encourage meditation as a regular habit. The main function of a meditation cushion is to elevate your pelvis, bringing your hips above your knees and encouraging proper curvature of the lumbar spine. When you are properly supported in your meditation pose, you’ll be less distracted by aches and pains in the knees or low back. By minimizing these physical distractions you will be able to sit for a longer period of time, reach a deeper meditative state, and thus maximize the benefits of your meditation practice. In the epic Bhagavad Gita, Krishna instructs to “lay kusha grass on the ground and then cover it with a deerskin and a soft cloth” to prepare a seat for meditation. Fortunately, we can now purchase cushions—also called zafus—that are specifically designed for meditation. With a recent explosion of interest in the practice of meditation, there are now a vast number of options in a variety of shapes and sizes to complement various seated positions and spiritual traditions. Most of the meditation cushions we’ve chosen for you check off all four of the above boxes, and we think you’ll love them! With its embroidered soft stretch-knit cover, this meditation pillow will look right at home in your living room or sit majestically in your meditation space. Handmade in the USA using eco-friendly and non-toxic materials, this pillow is filled with 4 pounds of buckwheat hulls. We received their Crystal Cove Bundle that also contains a Yoga Bolster and Pranayama Pillow of the same design. Based on their classic pillow design, this Zafu has 22 different color options, dyed with eco-friendly, low-impact dyes. Handmade in the USA with a certified organic 9 oz. cotton duck cover, this pillow is filled with 4.5 pounds of buckwheat hulls and finished with a heavy duty zipper. DharmaCrafts, in business since 1979, also offers many other meditation cushion designs, covers, inserts, fillings and Zabutons. If you’re seeking to add some fun and flair to your meditation practice, check out Yogaleena’s beautiful and quirky “hippie chic” pillow designs. This mother and daughter business makes over 30 different styles of zafus with a variety of printed cotton, upholstery, and imported woven fabrics to choose from. Yogaleena pillows are handmade in the USA and filled with 4 pounds of buckwheat hulls sourced from a non-profit organization that provides employment opportunities to adults with developmental disabilities. These cushions are sewn so you cannot adjust the filling. Designed and ethically made in San Francisco, this pillow is filled with 6.5 pounds of buckwheat hulls and has a cover made from a 100% organic blend of recycled cotton and hemp. 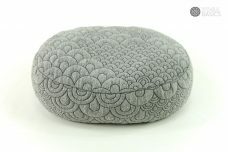 We received their meditation cushion set that also includes a matching Zabuton bottom cushion, which echoes the cushion’s unique and modern design. Upon purchase, customers may select an optional scent pack to add an aromatherapy scent to their cushion. This ergonomically-designed pillow creates a forward tilt in the pelvis, minimizing the pressure on the hamstrings and glutes that can occur during long seated meditations. Made in the USA, this cushion is filled with 6 pounds of organic spelt husk, which is more breathable and lighter in weight than traditional buckwheat husk. This cushion is available in eight color options and two sizes. The main differentiating feature of this pillow is its extra large size. If you are tall or have very tight hips, you will certainly appreciate the generous size of this cushion! It may be a bit firmer, wider, and taller than most need, but you can always remove some of the 9.5 pounds of organic buckwheat hull filling to get the height just right. Greetings. How do i go about purchasing and prices for products shown? Kind regsrds, Gabrielle. Just follow the links to the supplier’s website to purchase.